The 1 gang luxury crystal glass panel Sonoff wireless wall touch switch can be added to iOS/for Android App eWeLink via WiFi, allowing users to remotely turn on/off connected LED and lights from anywhere at any time. The remote wall switch's LED backlight lets users easily find and turn on the lights at night. The WiFi wall switch can be used to control lights or home appliances. 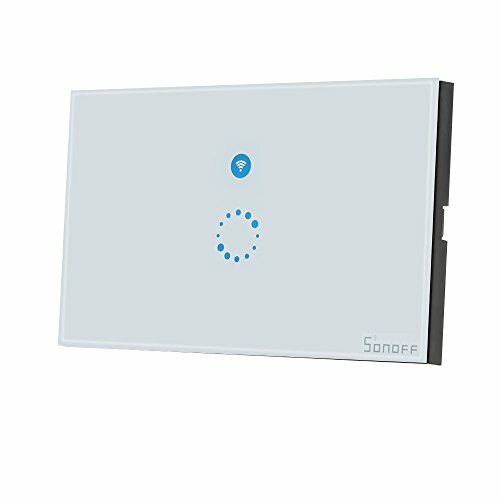 This modern fashionable wireless switch can make your home smarter compared with traditional light switches. *Voice Control: Works perfectly with Amazon Alexa, for G-Home, for G-Nest. *Sync Status: Real-time device status provided to App. Turn electrical devices on/off from anywhere at any time. *Timing: Supports countdown/single/repeat timing tasks to turn on/off at specified time. *Voice Control: Works perfectly with Amazon Alexa, for G- Home, for G- Nest.